If you’ve heard the buzz about bones and raw food diets for dogs and you’re thinking about trying it, you’ll need to minimize any chance of nutritional deficiencies and gastrointestinal upset by learning how to create tasty raw dog food recipes correctly and safely. The book “Going Rawr” by Maggie Rhines is a great place to start. This week the author is giving you have a chance to win a free copy of this downloadable e-book (normally $27 !). 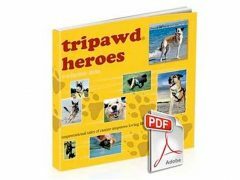 We’re having a drawing to give away one free copy to a lucky Tripawds member! learn more about feeding a raw diet to your dog. Contest deadline is Friday, October 19 at midnight Eastern time. For dogs fighting cancer, Going Rawr! also includes special raw diets for canines with compromised health. Going Rawr! comes with bonus reading material and recipes, as well as an unconditional money back guarantee. If it doesn’t meet your expectations, your purchase price will be refunded. NOTE: “Going Rawr!” is no longer available. 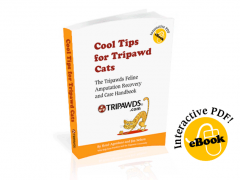 Find more raw feeding tips in the Tripawds Nutrition Blog. See recommended raw feeding books here! If you try Going Rawr!, share your thoughts in the comments field below, we’d love to hear your feedback. Contest deadline is Friday, October 19, 2012 at midnight Eastern time. “Going Rawr!” is no longer available. See more recommended raw feeding books here! We have had our 9 yr. old chocolate lab Hunter on a prepared raw diet for about 2 months now. He is doing extremely on it. The brand is Nature’s Variety and it is the chicken blend. We add blended leafy green veggies to this prepared diet. However, we would like to learn more about the raw diet and the possibility of making the diet ourselves so that we can afford to do this for all of our dogs. The raw diet we purchase costs about $90 for 30 lbs. and this feeds Hunter for almost 1 month. With 2 goldens at home, both who have had cancer issues, I would love to learn how to make a raw diet for them. I love these dogs more than I love myself. They are my children, and I would do ANYTHING to make their lives’ better. If a raw diet could help my dogs, especially the one going through chemo right now, I would do it. Belle is 4 weeks after front right leg amputation due to osteosarcoma. Her kidney’s are showing some damage, so we are still trying to decide between chemo or holistic. I have heard wonderful results from raw diet and would love to try it for both her and her brother Apollo. I teach cooking and love to cook at home! I would love to cook for my babies too!!! My mom has always home fed me and my pack mates, but she usually cooks the food, she has started to slowly give us raw bones and raw food because she has read a lot about how it is supposed to be so good for us, but she is concerned about supplements? too much bone? She has so many questions and the on line groups she has joined she has not felt are very helpful at all for beginners. While I had my leg removed because I was born with a defective rear leg, I don’t have cancer, my existing rear leg suffered damage due to a very poor diet when I was a wee baby, my mom is committed to keeping me as healthy as possible so that I can live a long happy pain free life and she feels that diet is one sure way to do that! She would love to win a copy of this book so that she can be assured that she is doing the best for me and my pack mates. Raw dog food will change your pets life. Whether you make it yourself of you buy a pre-made meal you will see your dog’s energy increase, stool size decrease, they will have a softer coat and allergies will be revealed.